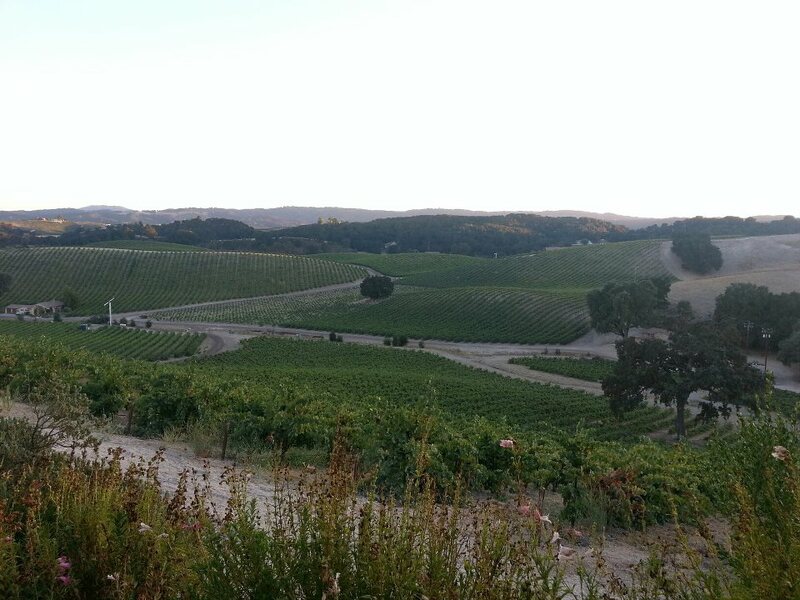 Located in the rolling hills of Paso Robles, Red Soles Stillhouse is a purveyor of innovative and unique spirits crafted with purpose by Randy and Cheryl Phillips. Randy and Cheryl Phillips have always been on the leading edge of quality and creativity in Paso Robles' booming wine industry. Starting as farmers providing some of the finest grapes the region had to offer, the duo took their business to the next level in 2007 with the opening of Red Soles Winery and they haven't looked back. Constantly seeking to remain ahead of the curve, the couple purchased a handcrafted still from Germany with the goal to produce high quality spirits. Randy and Cheryl infuse not only natural and dynamic flavors into their spirits, but also their love for the craft and for their home, Paso Robles. Come by and spend some time with the spirits, the owners, and the still for an afternoon that you won't soon forget! We ask that groups of six or more please schedule an appointment, either by phone or email. Our "new" Brandy is our unaged product that has been distilled from premium estate-grown wine grapes, without the addition of yeast or sulfites. Bold, dynamic flavors and aromas of green apple, pear, and black licorice shine when served neat, but this top shelf spirit is equally delicious mixed in your favorite cocktail! 750 mL. Our Limoncello was made with a base of premium late harvest viognier brandy. We infused the brandy with whole Meyer lemons in the still, and then further infused with additional Meyer lemons for forty days in stainless steel. Our process is incredibly unique in that we use the entire lemon, not just the zest, for a more complete and intense lemon flavor. Bright, lemony, and purely delicious! 750mL. This spirit is spicy, fun, and unlike any cinnamon product you've had before. To make it, we start out with premium unaged Brandy and re-distill it a second time with fresh cinnamon sticks in the still. After the second distillation, we let it sit with more fresh cinnamon sticks to give it its warm golden color, and to infuse it with even more cinnamon flavor. The result is a complex, spicy, and expressive spirit that would make a lovely addition to your liqour cabinet! 350 mL. 3 oz alcoholic ginger beer/ 1 jigger California Hooch/ 1 cinnamon stick/ serve over ice in fancy mug and enjoy! 1 1/2 oz California Hooch/ 1 oz Cinnamon Hooch/ 4 oz Sasparilla/ pour into tall glass with ice, stir, enjoy! 3 oz Cinnamon Hooch/ 7 oz Lemon Lime Soda/ 2 oz Grenadine/ Mix all ingredients in a cocktail shaker half-filled with ice. Shake well, strain into a highball glass, and enjoy! 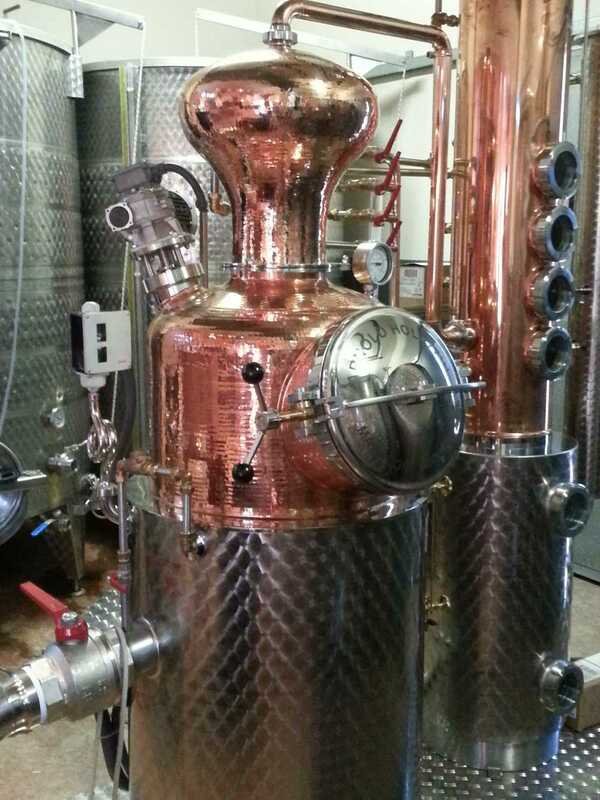 Our beautiful copper still came to us on a slow boat from the Arnold Holstein Company in Germany, handcrafted to meet our distilling needs. It is a 100 liter capacity combination pot and column still with an alembic arm to maximize flavor and allow for the creation of unique, one-of-a-kind spirits. The still earned the name "Patience" as a result of both the time Randy had to wait for its arrival from Germany and the time it takes to finish a batch of fine brandy. Red Soles Stillhouse is proud to have received the following awards for its spirits, and is working hard to pleasing many more taste buds to come.